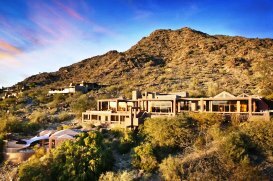 The affluent town of Paradise Valley, Arizona is located 28 miles Northeast of Phoenix. Despite the town’s relatively small area and population compared to other municipalities in the Phoenix area, Paradise Valley is home to 12 resorts, making it one of Arizona’s premiere tourist destinations. It possesses some very expensive real estate, with a median home price at $1.74 million dollar range and, with many homes exceeding $10 million, and some over $40 million. Paradise Valley mountains also has central terrain dominated by Mummy Mountain, Camelback Mountain to the southern border and Piestewa Peak mountainous area on the western border, giving Paradise Valley a quaint hospitality all its own.